On a related note to our post yesterday about people working into their retirement, did you know that a good majority of $1-million plus lottery winners keep on working, whether that’s at their old job, a new job, or launching a new business? As Yahoo News columnist Steve Mertl reports, the 50-something Ontario couple who won last weekend’s Lotto Max draw – $25 million! – don’t plan on retiring any time soon. And the Toronto electrician who took home $50 million from the same lottery last May also continues to work. “I don’t want to just sit there, get fat, and let my brain turn to mush,” he told a news conference. In the welter of reports last week about how Canadian retirees plan on working into their retirement years, a key fact might have been missed more often than not. It’s not just about the money. The reports were based on a July survey by Leger Marketing for CIBC that revealed that more than half of Canadians who are now in their 50s plan to keep on working after retiring. In Ontario, 55 percent of the respondents said they’d work post-retirement (and Ontario retirement age is pegged at roughly 63 by the survey). The reports pointed out that nearly half of 50-somethings have less than $100,000 saved for retirement (in Ontario it’s 46 percent), and suggested that post-retirement employment income would make up the gap. If your retirement living plan includes staying active and working, here are some financial tips we covered a few months back. Of course, moving to a small-town Ontario retirement community such as Meaford Haven is a great way to reduce your costs and your stress. 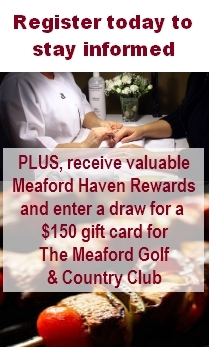 If you’ve been reading the Meaford media lately, you’ve probably heard the latest news about Meaford Haven. Meaford Haven is another step closer to realizing the goal of an active retirement community for the three seasons of your retirement in this beautiful Ontario town. Meaford Council has approved a resolution recommending to Grey County that the draft plan for the Meaford Haven subdivision be approved. Once the County approves the plan for the subdivision, Meaford will then be able to approve a re-zoning request for the development. Things are moving along for this unique Meaford retirement community, and we’ll keep you posted with more good news soon. Here’s the Meaford Express report on the new development. The Canada Mortgage and Housing Corporation senior citizen housing report has revealed that retirement home vacancy rates are decreasing across Ontario. While areas of the province have seen something of a boom in new retirement homes recently, the Baby Boom generation has already begun to retire, and within the next five years will begin to reach peak retirement home age. The demand for spaces in retirement communities and retirement homes will continue to increase, Ontario housing surveys manager Ken Sumnall told YorkRegion.com. Talk about an active retiree. Nearly 60 years after Marilyn Bell’s historic swim across Lake Ontario, the 74-year-old still coaches the sport along with her regular exercise in the swimming pool. An article in the Toronto Star yesterday profiles Marilyn Bell Di Lascio, who now lives in a retirement community in upstate New York, but finds every opportunity to enjoy the water, despite a degenerative back condition that makes it painful to swim. Back in 1954, the then-16-year-old surprised everyone by coming from nowhere to be the first person to swim across the lake. An American was the odds-on favourite to set the record, with backing from the CNE, but Bell achieved the milestone. 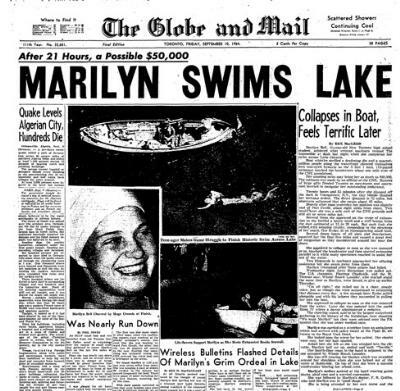 Both started around the same time, but Florence Chadwick dropped out partway across, and after a 21-hour swim, Bell climbed out of the water at Sunnyside Beach. “Retirement can come too early for many people who want and are able to remain active,” says the website for the 4,000 some-odd Probus clubs worldwide. The clubs are for men and women who’ve retired from their business or profession, and want to stay active in retirement and maintain a social network with other retired businesspeople. When planning Meaford Haven, we realized that an active retirement doesn’t always mean pursuits such as boating or golfing or skiing or jogging or cycling or skydiving or gardening. Some people want to share the experience and expertise they’ve earned in their working life during their retirement. A business club, we thought. Why not? Well, the next step was to the put the idea to the people who are interested in living at Meaford Haven. Our virtual focus group on a retiree’s business club at Meaford Haven tells us that in every 10 people, one or two have had enough of the working life, and do want to engage in new active pursuits during retirement. The rest generally think it’s a great idea. Here’s the the complete report. Today’s stop in our tour of local spirits takes us a little further afield, but we couldn’t leave off without sampling some of the delicious brews of this Grey County brewery. Back in 1857, Henry Huether arrived in Neustadt, and while he loved the village, he immediately realized something was missing. A brewery. The springs at Neustadt provided clear, cold waters perfect for beermaking, and he hired a large team of German stonemasons to build a brewery over the springs. Within two years, the Crystal Springs Brewery was delivering barrels to taverns far and near, and it continued to do so for the next 57 years – except for a brief period when fire damaged the building, which was quickly remedied by thirsty farmers who brought in fieldstone to rebuild the brewery in exchange for beer. By 1916, prohibition and a decline in the local population led the brewery to shut its doors, and Neustadt’s brewing days seemed over. Nearly 75 years later, a couple from England with experience at breweries in Lancashire and North Wales visited Ontario and fell in love with it. Andrew and Val Stimpson moved here in 1995, with plans to open a pub, but Andrew couldn’t find a local beer that he liked. So he decided to brew his own, and settled on the abandoned brewery in Neustadt, where the springs still flowed through a network of caverns below, as the perfect location. After nearly a year of renovations, and 81 years after the original brewery closed up, Neustadt Springs Brewery released its first batch of beer. It sold out within five hours. 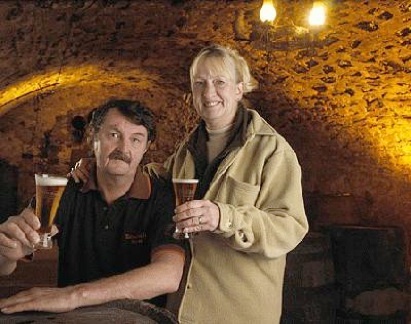 Andrew and Val Stimpson in one of the vaulted stone cellars below Neustadt Springs Brewery. In the years since, the brewery’s offerings have earned a host of Canadian and international awards, and you can find its biggest sellers (10W30 Brown Ale, Neustadt Lager, and Neustadt Scottish Pale Ale) at many LCBO outlets. But when you visit the brewery (and book ahead to take a tour), make sure you bring home its less well-known, seasonal brews: Big Dog Beaujolais Porter, Texas Tea Honey Stout, 456 Marzen Lager, Mill Gap Bitter or The Sour Kraut.